A recent saunter in Blogosphere found me on Ced's blog to read about Cafe Gratitude in San Francisco, which led me to Sam's brilliant post on es-eff-ist about the same odd little place. A few more clicks and hops through the internets dropped me at a forum advising the whole world to go with the flow or current or some such things, where I found this nugget of, um, wisdom. Hot tea is NOT ETHICAL. Adding boiling water is a way of COOKING FOOD, and cooking goes against the nature of ABUNDANCE. When you cook something you KILL it, and KILLING reduces the possibility of SHARING. The only way to ethically drink tea is to add water at ENVIRONMENTAL TEMPERATURE (being the temperature at which algae and other water-dwelling organisms such as fish can or could reproduce) and then wait for an ETHICAL AMOUNT OF TIME before drinking. Only then can you be ABUNDANCE. No, I don't think they are kidding. I was hoping so too, alas, they're certainly not kidding us. They are right though, I guess. Cooking certainly kills -you know, bacteria and such- and also reduces the possibility of sharing -you know, diseases and things. If this is what they mean by living in ABUNDANCE, I'll take paucity any day. ..but white thanksgiving instead. I know Thanksgiving was really two days ago, but I'm only celebrating it today, which also happens to be the first snowy day of the season. Alisa, who doesn't have a blog but she darn well should, is hosting a thanksgiving for us desperate souls who found ourselves just a little too far to go home for turkey. You probably know a few of us who will be celebrating together tonight, what with the world being so small and all that. Frankly, I'm not exactly a fan of that ugly bird. I don't think it tastes like much of anything. But I guess I am learning that the best way to dress a turkey is with kindness and generosity. See, there is something new to learn every day. 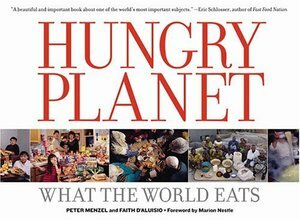 The Hungry Planet: What we learn from what the world eats. I am a firm believer that one key to co-existing in this increasingly messy world is empathy. I also believe that few things can teach us more about our neighbors than simply peeking into their kitchen windows. What people eat, what food is available to them, what they cook, how they eat, even the smallest things in our larder can tell a huge story. I recently came across a book to feed just that part of my curiosity. It's called Hungry Planet. Aaron from Ten Speed Press in Berkeley gave it to me when he came to dinner a couple of months ago. From the first minute I opened up the first page, I was hooked. Or a mini confession, perhaps. I was afraid of moca pots. You know, that fabled Italian coffee making contraption that everybody and their brothers rave about? I was afraid of them. To me, they were menacing, threatening to explode in my face if I left them just a second too long on the stove. That sounds rather silly, I know. Well, I should probably tell you I'm afraid of pressure cookers as well, for pretty much the same reason. Notice I said reason? Well, I'm happy to say that is no longer true. (At least the moca pot bit, I'm still not going to look the scary pressure cooker in the eyes.) A few days ago my friend David L. insisted on loaning me one of his treasured moca pots, after patiently explaining to me how unlikely it was for the moca pot to actually explode as I feared. Ever so reluctantly I took his advice. 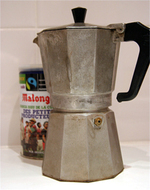 I also took his advice on the Malongo fair trade coffee as well -bought from Monoprix of all places. 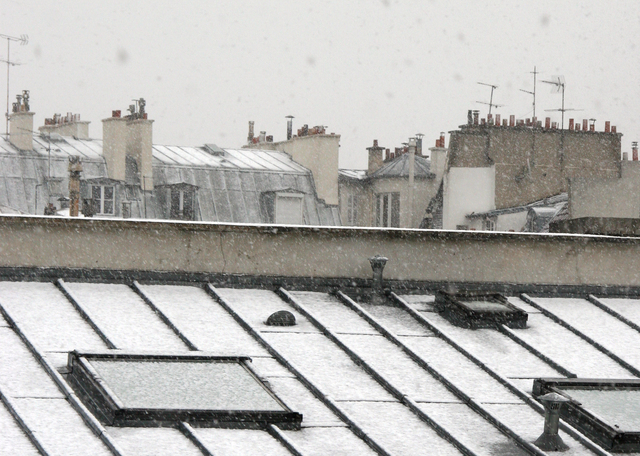 And this morning I have a huge bowl of delicious café au lait to thank him for. Who knew that moca pot would make such a great coffee? I hardly remember now how I put up with the muddy french press coffee when I was away from my espresso machine! I'm not even going to speak of the Illy pods, whose undue influence I was under for years before I was finally liberated by the kind folks at Bluebottle Coffee Company. There's something new to learn everyday. So my computer is dead. I was hoping to spend this quiet Sunday catching up on blogging and email (which has about a few weeks worth of backlog due to accessive traveling combined with laziness). Alas, it is not to be. My little computer went to sleep last night, and this morning it refused to wake up, no matter how I pleaded. Luckily I've spent the last day or two uploading recent photos into my flickr, so you could at least occupy yourselves with them until -or should I say if- my computer returns to life. The first photo on this slide show was one of my favorite dishes of our shopping/cooking trip to the South. At the wonderful fish market in Ventimiglia, we found some anchovies so fresh they were practically breathing still. I couldn't help but bought some. When we got back to the house in Mougins, David set about fileting them with expert precision, then he cured them for a couple of hours, covering up the filets entirely in gray salt. We served them as the first course with a splash of good olive oil and some fennel flowers that we found in the garden. Simple, and just delicious. Click on the photo to see more of our cooking fun. Also, I've put up two other photo sets, from our trips to Ventimiglia market and San Remo market in Italy. à bientôt...I hope. Wish me luck. Good news, my computer isn't dead after all. I walked all the way over to David L's penthouse to see if he could help resuscitate my baby, and as it turned out, it's not my computer that's dead, it's my power adapter. Silly me. So tomorrow I will find a new power supply, and for now I only have a couple hours on this battery to catch up on a few things. More posts on the French and Italian riviera and also many more on the week in Burgundy up soon, I promise. The scene was a dark parking lot, somewhere in Monte Carlo, in the Principality of Monaco. We had been waiting impatiently for the arrival of a mysterious figure, known only as the Truffle Don. 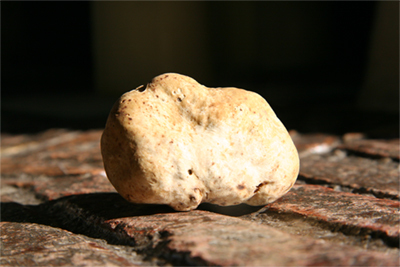 The Truffle Don is something of a legend amongst those in the know up and down the Riviera. Many have heard of him. Yet only the lucky few could truly vouch for his existence. He always travels with a driver, who looks to me more like a bodyguard. I suspect he serves both purposes. He sells the best truffles. 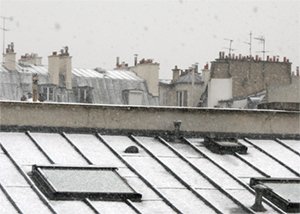 Only white. And only from Alba. Nothing and nowhere else. The problem is you'd have to find him first. And, between you and me, that's not an easy thing to do. Of course it is not a simple matter of money. This is the Côte d'Azur we are speaking of. Everyone here has money, and probably more than you or I have. Michelin is making news in New York this morning. The famous red guide finally published its first ever guide in the US, specifically for the New York market. To some, Michelin has been generous, awarding the highly-lauded three-star rating to four restaurants in New York: Le Bernadin, Per Se, Jean-George, and, of course, Alain Ducasse. For others, some glaring omissions or perceived snub would likely rub them the wrong way. The ever popular Babbo with only one star rating is one example. The wonderful Blue Hill without even a star to its name is yet another. I don't have much time now to comment on this so I'm just going to include the entire list here and you girls and boys can form your own opinion. As for me, I'm in Lausanne this morning, on our hotel balcony overlooking the serene lake. Last night was a lovely meal at Philipe Rochat -a non-controversial three star if there ever was one. This afternoon will be Monaco, for tomorrow night at the Louis XV -yet another one of Alain Ducasses outposts. After that we will be shopping and cooking with our friends for a few days in Nice. New York is far, far away from my mind.